It has suddenly got very cold here today in Boulder, Colorado and snow may well be on the way soon. So I wrapped up in one of my favourite winter cardigans knitted with Rowan Scottish Tweed Aran to keep me warm while I flicked through two of Rowan’s latest winter pattern books in search of another cosy hand knit. 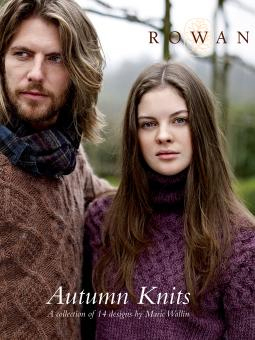 Amongst the seven Autumn/Winter new publications, Rowan have two pattern booklets featuring similar designs: Autumn Knits and Pioneer and I will be giving one of them away …….read on to see if you would like a chance to win a copy. 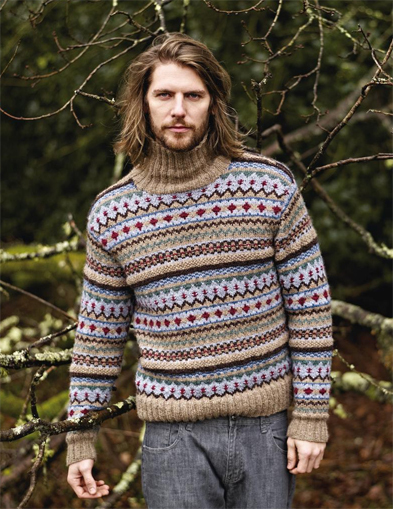 Autumn Knits is, “A collection of 14 knits for men and women which epitomizes the trend for chunky textured and graphic style knits. Using the wonderful yarns cocoon, lima and lima colour, this stunning collection ranges from plain, draped and easy to wear designs to cables and textured sweaters and wraps”. 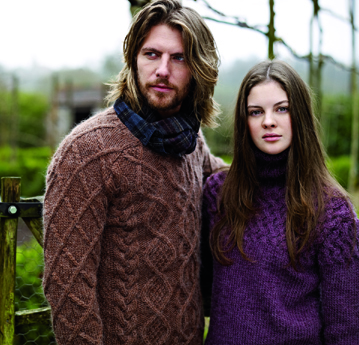 From the Autumn Knits collection I really do like these designs…………..
Hope (above) designed by Marie Wallin using the luxurious yarn Lima. Ilam (above left) and Wye (above right), both designed by Marie Walling and knitted in the yarn Cocoon. Youlgrave (above) designed by Marie Wallin using the yarn Lima. The yarns used for these designs, Lima, Lima Colour and Cocoon, may well become my first choice for cosy knits in the future. Lima is a beautifully soft and lightweight yarnn which is not surprising to me as it is a blend of “the finest baby alpaca and merino wool in a chain construction”. I am such a fan of all yarns containing alpaca! Lima is great for colour work and stitch definition alike. Lima Colour has the same fibre content and construction as Lima but with a subtle colour effect. Cocoon is a soft roving British yarn made from a blend of merino wool and kid mohair. It creates beautiful textured and cable stitches and lovely striping and pattern effects. I have just ordered some Cocoon in the shade Saturn………. 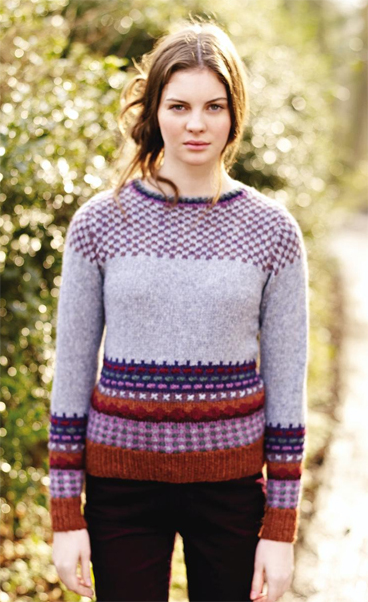 When it arrives I will be knitting a lovely design (below) which I saw in the Holiday 2013 issue of Vogue Knitting by Sarah Hatton, one of my favourite Rowan designers. 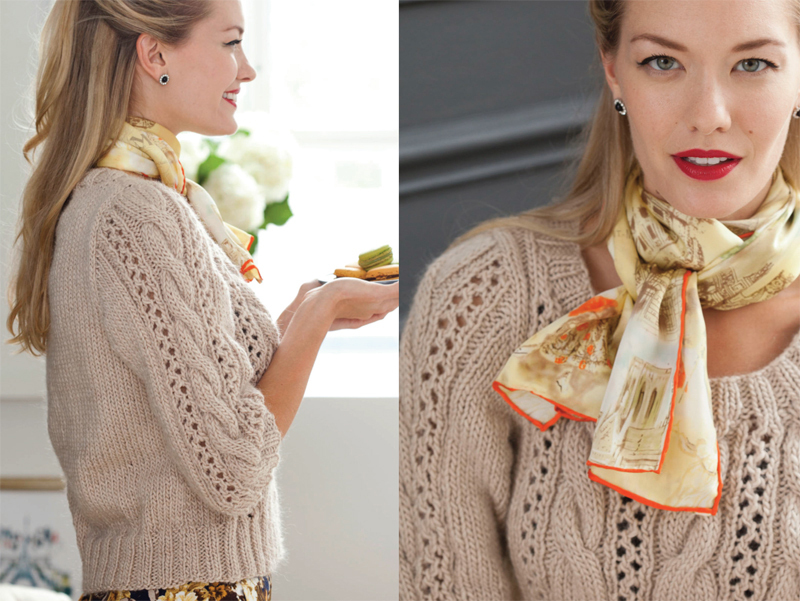 Picture above taken from the Vogue Knitting website. Anyway, back to the Rowan patterns and Pioneer. 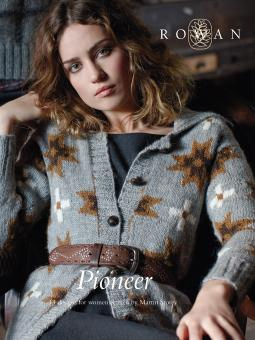 Pioneer is “a collection of 15 hand knits for both men and women inspired by the pioneer look of the Midwest and hand crafted lifestyle.” The collection, designed by Martin Storey, features rustic cables, intarsia star jackets and also simple to knit minimal designs in a palette of dark neutrals with rose and lime highlights. They are all designed by Martin Storey using Creative Focus Worsted, Pure Wool Aran and Big Wool. From Pioneer I really do like these designs…………..
Quilt (cardigan) and Crockett (cabled grid sweater) shown above, both knitted in the yarn Creative Focus Worsted and both are available in women’s or men’s versions. 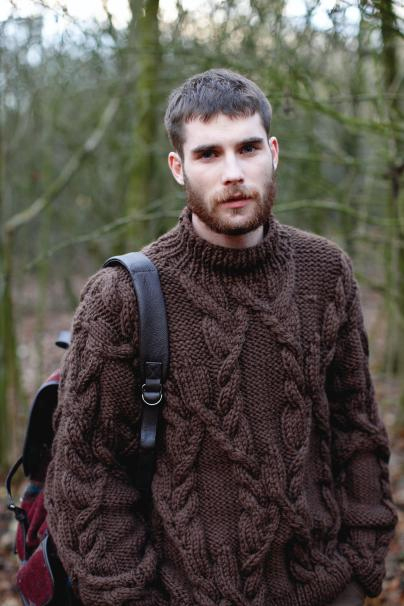 Frontiersman (above) knitted using the beautiful yarn Big Wool. Schooner (above) knitted using the beautiful super wash wool yarn Pure Wool Aran. Creative Focus Worsted is a “lovely wool and alpaca blended aran weight yarn. 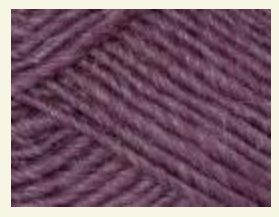 This is the perfect ‘all round’ yarn for stitch, pattern and colour work”. It comes in 24 shades including reds and pinks, blues and greens, five different greys, a yellowy-orange and a black. So, you don’t have to stick to the designs dark neutrals, you can go bright if you like. Recommended knitting needle size: 4½ mm (US 7). Pure Wool Aran is a hard wearing 100% wool yarn yet quite soft. It is machine washable which makes it a great choice for all. It comes in 18 colourful shades including ivory and black, four blues, a yellow, an orange and a bight pink. Recommended knitting needle size: 4½-5 mm ( US 7-8). Big Wool is a one of Rowan’s popular yarns. It is made from 100% merino wool making it feel lovely and soft next to the skin. Having used this yarn many times I know how easy it is to knit with and produces fantastic cabling and stitch structure effects. It comes in 24 shades from darks to brights so you’re bound to find several you will like. Being a chunky yarn it knits up quick on large sized knitting needles 10 to 15 mm (19 to 10 US). Let me know either by a comment below or contacting me here which design you would like to knit and which shade(s) of yarn you would use to knit it up. One of the entries will be chosen at random on Wednesday November 27, 2013. Anyone can enter, wherever you live in the world! Have fun deciding and good luck. To view all the patterns and yarn choices click on the links below. This competition is now closed and the winners are Imogene and Melissa……..Congratulations to both!